Coming to kickstarter May 2019! 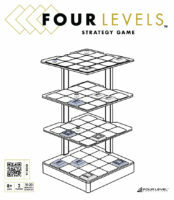 Four Levels is a two player game, ages 8 and up, with gameplay 10-20 minutes and is easy to learn and fun to play. The easily assembled 3D structure makes a unique playing field. The object of the game is to create four like pieces of the same color in a straight line on one or all four levels. Playing pieces include wild pieces that can work in combination with other pieces to create a winning combination. Pieces are played in a set sequence, so you always know what pieces your opponent will be playing next. Game should be released in 2019 Q4, so watch the news!